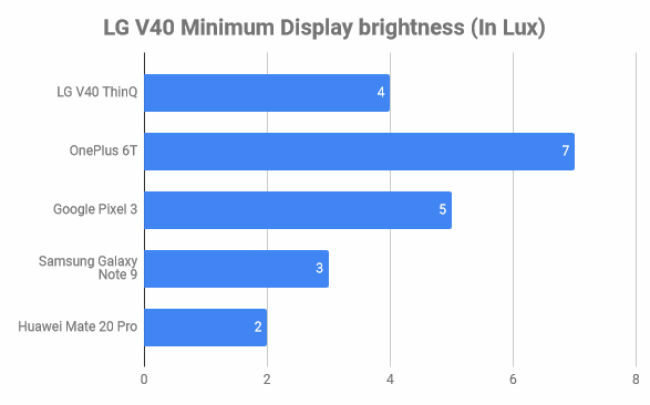 The LG V40 ThinQ isn’t for everyone. It has a plethora of features all tuned for the mobile cinematographer. But it’s camera is also the weakest link. While the LG V40’s five-camera setup offers the versatality a vlogger might demand, it doesn’t really match up to the expectations set by the phone’s marketing. But if you’re not a vlogger or deal with videos for a living, the LG V40 ThinQ can still be yours for everything else it offers — HiFi audio, qHD HDR display and a sturdy build with water resistance and everything. 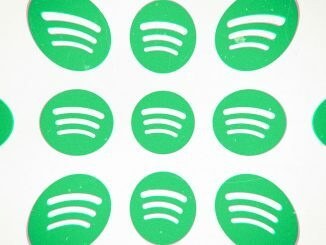 It’s a power user’s flagship through and through, but certain caveats like a camera that tends to overprocess photos, poor gaming performance and a confusing UI might put off the mainstream users. To know more about how the LG V40 ThinQ fares, read the full review below. With the advent of glass-sandwich designs, there’s now a big difference between a classy look and a sturdy build. Most tend to be on the former side, but just like with the LG G7+ ThinQ, the LGV40 ThinQ looks both classy and solid. 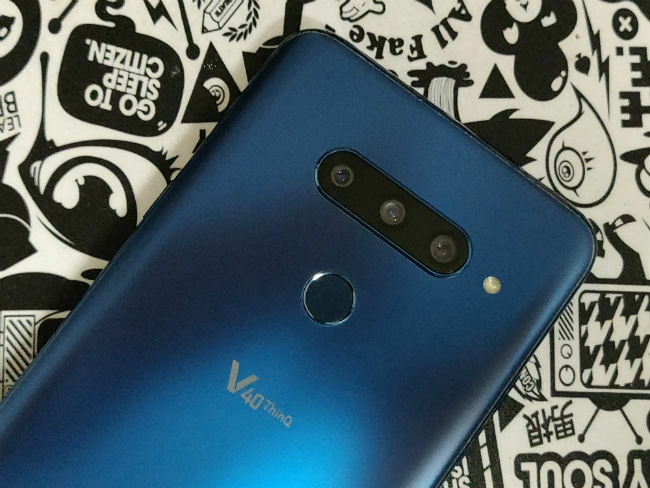 The V40 ThinQ doesn’t look like it would survive much wear and tear, but the phone is MIL-STD-810G compliant which means the phone was tested in conditions that armies find themselves in. Still I managed to put a deep gash in the middle of the display after the phone was kept in my pocket along with my keys, but only after doing so for a week. The phone is also IP68-rated water and dust resistant, just like the LG G7+ ThinQ. During the week of my use, I did manage to accidentally drop the phone once while taking it out of my pocket and there were no marks to show for it. It even got brushed against the wall a couple of times with no damage whatsoever. Clearly this one is built sturdily despite having a glass surface on both sides. At first glance, it’s impossible to tell how durable this phone is. The glass body oozes class. We received the Moroccan Blue colour variant that has a smooth sandblasted matte finish. While it does look premium from every angle, it’s also extremely slippery. Keep it on an angled surface or even when it’s cradled loosely in your palms, the phone will slip off. The polished frame doesn’t help with the grip, which is why we had to chip points away from the ergonomics of the phone. 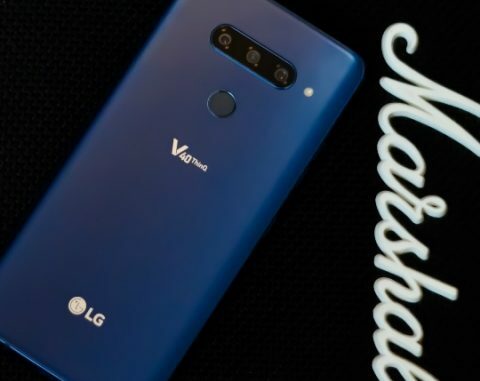 The rear panel also has the LG and the V40 ThinQ logo showcased prominently. The fingerprint sensor is still rear mounted, but unfortunately LG made it non-clickable. The clickable fingerprint sensor on the LG V20 was quite useful and did away with the power button altogether. On the LG V40 ThinQ though, buttons are back with the lone power button on the right side and the volume keys and dedicated Google Assistant button on the left. Yes, this one still has the dedicated hardware button for Google Assistant (combined with the usual ways of summoning the assistant) which was quite bothersome. While the power button is placed way up top and is very hard to reach, I often mistook the Assistant button for the power button and had to keep disabling the voice prompt as a result. Thankfully it can be disabled, but unfortunately, can’t be remapped to do something else. 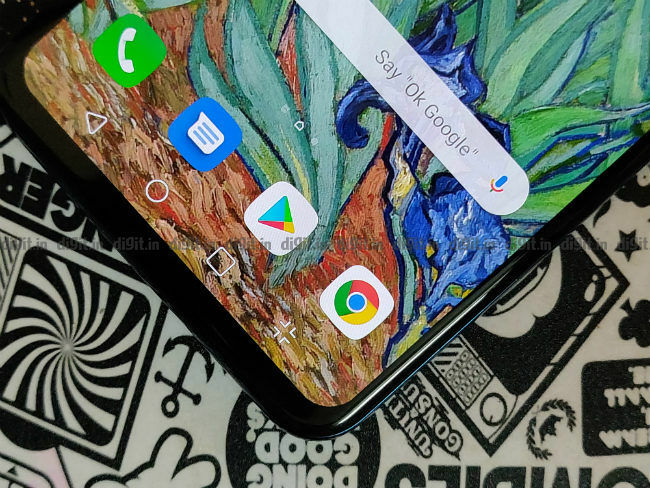 The 3.5mm headphone jack which is fast disappearing from smartphones is still a key feature on the LG V40 ThinQ particularly for its audio capabilities, and is now on the bottom of the phone alongside the speaker grill. There’s a microphone on the top and the bottom. Turning the phone around, you will notice the largest screen on a LG device ever (measured diagonally). But like almost every smartphone launched last year, the V40 also carries the infamous notch. The design was successfully turned mainstream, but being the finnicky reviewers that we are, we still hold it against our good judgement, especially when despite having a wide notch, there’s still significant bezels on the top and the bottom. It’s minimal around the edges and doesn’t really get in the way of viewing things, but once you do spot, it’s difficult to unsee it. Overall, in comparison to the bling and glamour that most flagship phones indulge in, the LG V40 ThinQ is subtle, classy and premium. 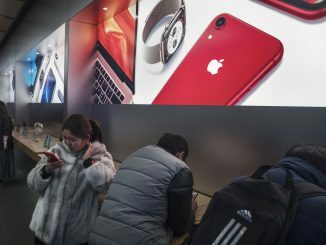 There are the flagship-grade excesses you tend to find in expensive phones like the sheer number of cameras on the phone, but it’s all arranged and aligned so well, it all seems perfectly reasonable to have. In a lot of ways, the phone felt like an elder brother of the LG G7+ ThinQ. Thing is, everything you get on the LG G7+ ThinQ (except for the extra cameras), you get on the LG V40 ThinQ, as far as the design and build is concerned. Like we mentioned before, the LG V40 ThinQ carries the largest panel seen on an LG phone ever. LG pegs the V-series as one made for ‘creators’, and a large display plays a major factor in boosting the multimedia capabilities of a phone. Add to that the specs of the panel and any display nerd will get excited. The LG V40 ThinQ sports an expansive 6.4-inch POLED display. 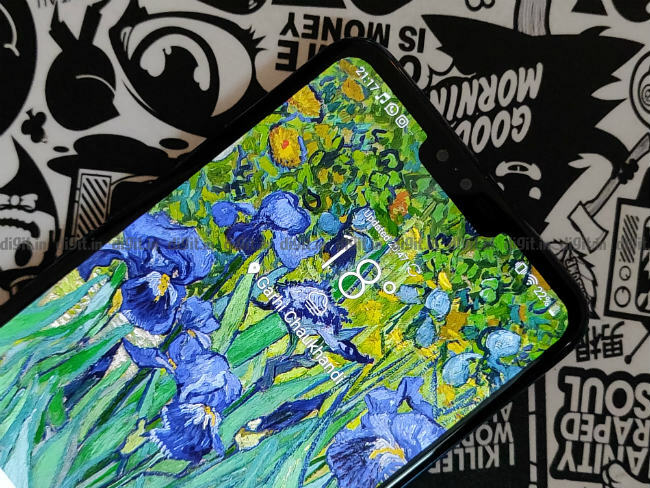 The display is made by LG themselves and is similar to the one used on the Google Pixel 3. However, this one is a 10-bit panel with HDR10 certification. 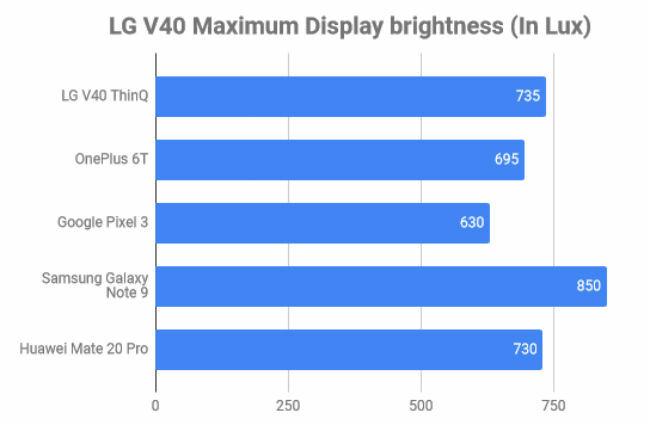 That’s the same specs as the LG G7+ ThinQ, once again proving our point that that V40 is simply an elder brother to the phone. Interestingly, this LG flagship, like the G7 also skips on the Dolby Vision certification unlike the LG G6 which was the last phone by the company to be certified by Dolby. Nevertheless, HDR content on the LG V40 look fantastic. You can distinctly make out the difference HDR technology has on visual elements like dark regions and texture details. However, finding HDR content online is still rare. There are some short videos on YouTube and then you can stream HDR content on Netflix, with limited choice of shows and movies. As a result, I don’t really find this feature all that groundbreaking but it certainly makes the phone quite future-proof. What left me impressed was the contrast and sharpness levels. There is a polarisation film above the OLED panel. The contrast levels along with the polarisation film make the screen quite usable outdoors under sunlight. We also registered high brightness values of 735 lux with auto brightness turned on, and 705 lux when it’s manually taken to the max. That’s quite high as compared to other flagships, and makes things appear really bright and vibrant. The phone’s minimum brightness, however, isn’t quite as low as the Galaxy Note 9. Even on minimum brightness, the panel gave out 4 lux light which is quite high. There is a blue-light filter but a higher minimum brightness might impact your sleep time if you’re using the phone to read something before going to bed. If you are display nerd, however, you might end up spending hours calibrating the display. LG offers a full suite of display calibration. There are five presets including game, movie, sports, etc. And then there’s auto and expert mode. In both modes, LG offers the ability to tweak individual RGB channels as well as the colour temperature. Coming from the Huawei Mate 20 Pro, the LG V40 ThinQ display’s felt expansive and immersive particularly for its large size. Both panels have 1440p resolution, but LG’s panel felt a little more vibrant as compared to Huawei’s flagship. 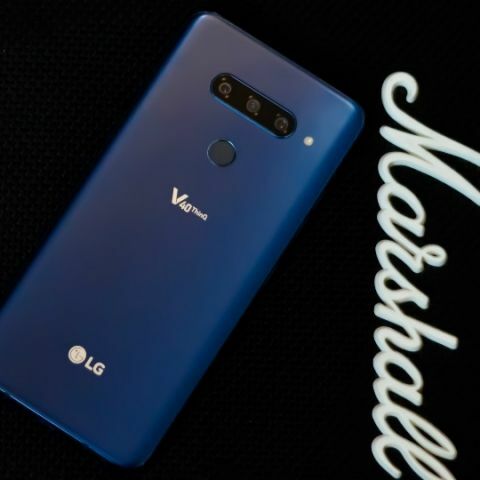 The LG V40 ThinQ released during peak smartphone season in South Korea, but took an awfully long time to come to India. The phone launched late in December right before the year was ending and it wasn’t until early February that we received the unit for review. 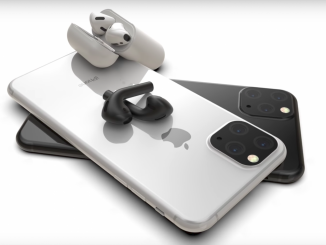 With Mobile World Congress right around the corner promising latest innovations like the Snapdragon 855-powered phones for instance, a phone with Snapdragon 845 naturally will sound underwhelming. But we chose to ignore the phone’s late launch and evaluated based on what 2018 flagships offered. The LG V40 ThinQ offers every flagship hardware in-vogue in 2018 — Qualcomm Snapdragon 845, 6GB RAM LPDDR4X and 128GB storage UFS 2.1 storage. You will get low transfer speeds as compared to phones like the Samsung Galaxy Note 9 since the V40 only supports USB 2.0 and not USB 3.1 which is not very flagship-like. There is also the option to expand storage up to 512GB via a microSD card. If you’re a dual SIM user though, it comes down to a choice between using a second SIM and expandable storage. Coming down to the phone’s performance, the flagship Snapdragon chipset ensures the LG V40 ThinQ runs without a hitch. There was no visible slowdowns or lags even though the LG UI is quite processor-intensive. However, in the middle of a typical work day, I found myself having barely 22 percent RAM available, which is not a good thing in case you need to multitask. But when I did need to keep Google Keep and Google Chrome open in split-screen, it didn’t give me any grief. The benchmark numbers will tell you this is not the fastest phone out there, but it’s right there with other flagships. 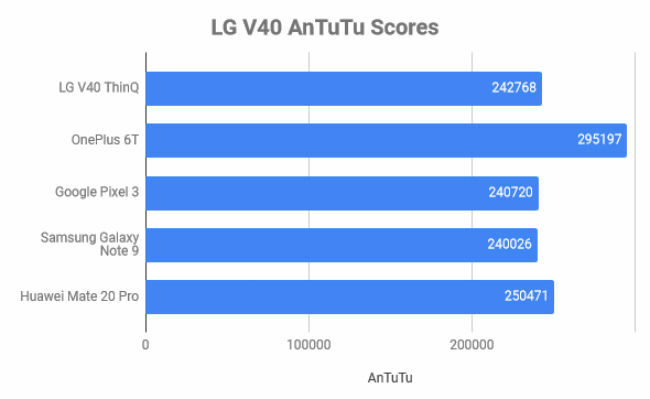 On AnTuTu, the LG V40 ThinQ clocked 242768 while on Geekbench single core and multi-core tests, it scored 2397 and 8452 respectively, both in-line with most other Snapdragon 845 powered phones. We also ran PCMark’s Work 2.0 where it gave an impressive score of 7982. 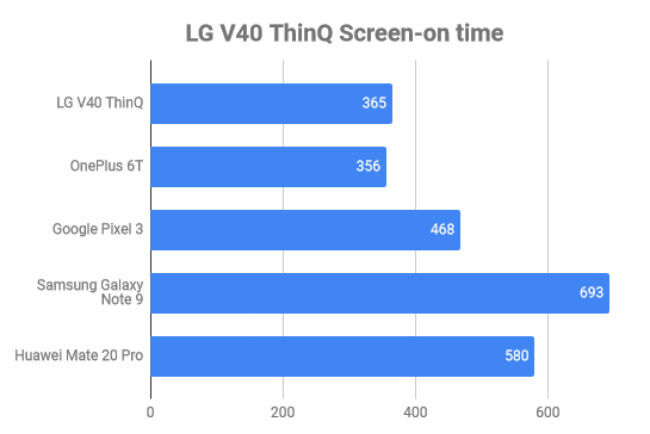 LG has been putting its ThinQ branding on its flagship phones these days and the V40 receives the same treatment. It has Google Lens integrated in the camera with a dedicated Google Assistant button along with smart suggestions and some other AI-centric features strewn here and there. We put those AI capabilties to test with the AI benchmark app which claimed the phone had ‘medium performance’ with a score of 4735. When it comes to gaming though, the LG V40 ThinQ isn’t the best phone around for playing popular titles like Asphalt 9 and PUBG Mobile. 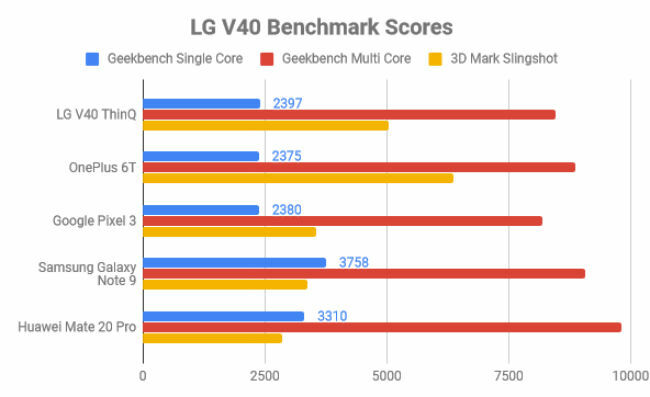 Graphics benchmarks like 3DMark Slingshot gave a medium score of 5049 while GFX Bench’s high-level tests like Manhattan and Car Chase gave 1474 and 894 frames respectively. Even on GameBench, PUBG Mobile gave 39 FPS with poor 91 percent stability. The janks were distinctly visible while playing the game. Asphalt 9 gave a frame rate of 28 FPS with 88 percent stability. Clearly, this isn’t the fastest phone around. But using the phone for more than a week, I never saw it slow down even once, except for while gaming where it randomly skipped frames. It’s actually a reliable daily driver with good multi-tasking abilities and excellent multimedia capabilities. With its vibrant display and superior audio capabilties, the LG V40 had the potential to be an excellent gaming phone, if only it was well optimised. Where the LG V40 falters in gaming, it more than makes up in terms of audio, be it through a wired headset, wireless headphones or even through the loudspeakers. In all cases, the LG V40 offers a superior experience. When using a wired headset, the LG V40 uses the 32-bit HiFi DAC to amplify the audio. There is a distinct improvement in audio quality even when using budget headphones or the ones bundled in the box. The real impact of the DAC will be felt if you’re listening to lossless audio through high-impedance headphones. There’s also DTS: X 3D surround sound that simulates a surround sound feel through a pair of headphones. If offers three separate surround sound options — Wide, Front and Side-to-side. I did find myself turning on the feature while listening to hip-hop, and the result was quite good. As for the DAC, we couldn’t source a high-impedance headphones to get the full suite of improvements, but even the ones that comes in the box are good enough to give you a good enough experience. The loudspeaker on the LG V40 ThinQ is also quite useful. There are situations when you need to play audio out loud for people around you to hear and the boombox speaker comes handy. It routes audio majorly through a bottom speaker, while the earpiece on top also does output some part of it. It’s also sufficiently loud and deep, offering good clarity even at peak volumes. The volume is amplified even more when the phone is set against a hard surface, and frankly, I believe this has the loudest speakers among smartphones. While most phones these days have good enough audio, the LG V40 lets you go the extra-mile to prove your audiophile status and like most things excessive about the LG V40, this too sets it apart from the rest. The user interface of the LG V40 ThinQ is almost identical to that of the LG G7+ ThinQ, based on Android 8.1 Oreo. While that was okay for the G7+ ThinQ, the LG V40 came out at a time when Android 9 Pie was already out. In fact, even a couple of years back, the LG V30 was the first to bring the latest Android that year. There’s also no indication from LG when the phone will receive an update in the future as well. The LG V40 ThinQ, however, looks quite polished from the inside. It does take some time to finally get everything in order. When you set it up for the first time, you’ll likely spend a lot of time in the Settings app, both exploring and looking for specific features which are usually found with ease. The Settings menu is in fact a maze. Every tap reveals new features and the amount of customisation it offers will keep Android users busy for a long time. There’s a dedicate theme engine along with the option to customise how the area around the notch will look. You can apply custom icons and choose to remove the app drawer. LG even offers the ability to create folders in the app drawer, something that I’ve always wished for in most devices I test, but few offer. LG doesn’t support gesture-based navigation yet. It’s the teasing theme of the upcoming LG G8 though, and should likely be added after the update to Android 9 Pie. It does offer shortcuts like a floating bar with quick access to buttons. 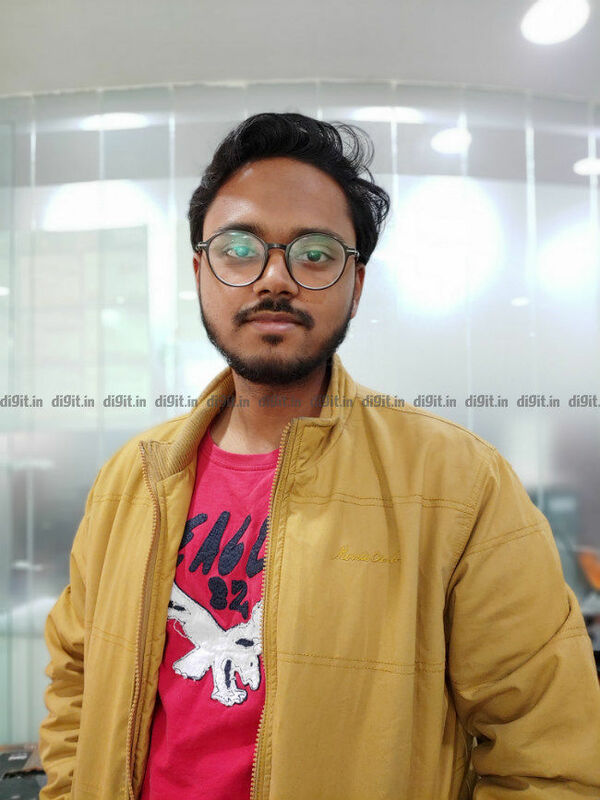 The UI is quite fast and responsive and common apps like Facebook, Instagram, Chrome, Google Play Store and the Dialer open without any visible delay. I also happened to love the haptic feedback from the phone. What’s unfortunate is that the phone runs on December security patch, and for the week I used the phone, there was no update. LG offers fingerprint and face recognition to unlock the phone. The fingerprint sensor is super responsive, but the face recognition is nowhere as fast as the OnePlus 6T. The LG V40 ThinQ has a total of five cameras on the body. Three on the back and two on the front. Triple camera setups are no longer new in the market and so are dual front cameras, but no phone, so far offers both. With five cameras, the LG V40 ThinQ offers excellent versatility to shoot in just about mode you want. The rear camera setup comprises a telephoto lens, a wide-angle lens and a standard lens, in that order. 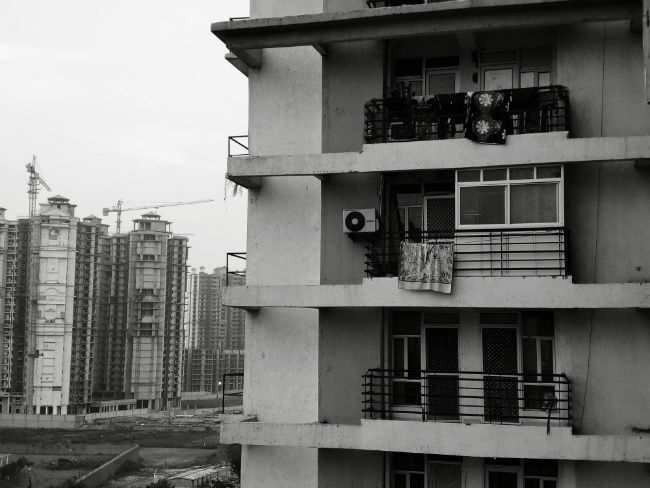 They’re horizontally aligned, housed in a single module with the flash sitting outside. The telephoto makes an appearance on a LG phone for the first time, and on the LG V40, it’s a 12MP 1/3.4” sensor with 45 degree field of view and 2X zoom. The super-wide angle sensor is a 16MP 1/3.1” sensor with f/1.9 aperture (widest for a wide-angle in any phone) and 107-degree field of view with 1um pixel pitch. Finally, the standard sensor is a 12MP 1/2.6” sensor with f/1.5 aperture and 1.4um pixel pitch. It’s essentially the same triple-camera setup as the Huawei Mate 20 Pro, but with different sensors and lenses. The LG V40 allows you take photos in just about every way. The ultra-wide sensor also doubles up as a macro lens, but a lack of autofocus in it makes it slightly troublesome. Huawei’s wide-angle sensor does have autofocus though and the super-macro mode on it, as a result, is far more useful. On the front, you get a standard 8MP sensor with 80 degree field of view and f/1.9 aperture. The second sensor is supposed to be a wide-angle sensor but it’s FOV is just 10 degrees more while the resolution is even lesser at 5MP. LG also designed a feature to showcase the triple-camera setup called Triple Shot.It basically takes three simultaneous shots from each of the rear camera in around three second and creates a short video out of it, with it’s own background score. It’s essentially a gimmick that can find usefulness only in certain situation for a dramatic effect. The triple shot feature just about sums up the camera. It’s fairly useful but overly dramatic. The LG V40 ThinQ has superior optics, but it’s the phone’s overprocessing at times makes it consistent. For me, I had fun shooting with this camera and it produced some great results. But it’s only when you pixel peep that you start seeing the discrepancies. Daytime shots like these come out really good with excellent composure. The LG V40 ThinQ produces excellent range in capturing details in both the lights and shadows. But it’s only when you look closer that you spot the photo hardly has any details. The texture of the walls are all muddy if you zoom in even a little while the edges of the railings are jagged and uneven. Without zooming in, however, the photo looks very well-balanced. Once again, when there’s a good play of lights and shadows, the camera captures it gracefully. In this case, the LG V40 ThinQ automatically turned on HDR and managed to capture every minute detail of the photo. However, once again, if you zoom in to the original photo, the details degrade to a great extent. I believe it’s the small sensor and pixel size that’s unable to retain granular details. This is yet another example of what the LG V40 ThinQ can do with adequate daylight and drama. Most cameras will expose for the sky and darken the rest of the scene. Not this one though, even when it’s exposed for the clouds, the partially sunny sky was perfectly captured keeping the details even around the shadows around the trees intact. The camera is also quite adept at reproducing colours quite accurately. The accuracy in reproducing colours become apparent in this photo. The camera produces good contrast between shadows and highlights which paints a dramatic effect over the scene. There might not be many fans of this gritty effect , but I frankly liked the effect quite a lot. The versatility of the LG V40’s camera comes into play when you use the wide-angle camera. 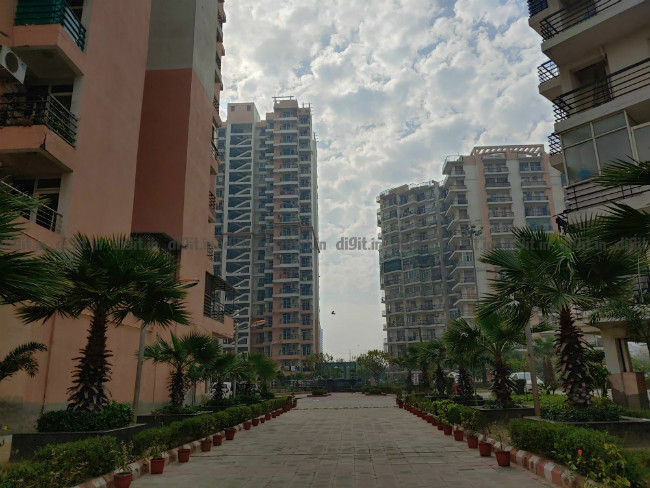 It’s one of the best wide-angle cameras you will find in smartphones and can rival that of the Huawei Mate 20 Pro. With a wide 107-degree field of view, the frames feel expansive and you can cram a lot of objects in the photo with almost everything coming out sharp and crisp. The samples we took showed LG’s proficiency in wide-angle photography as far as smartphones are concerned. 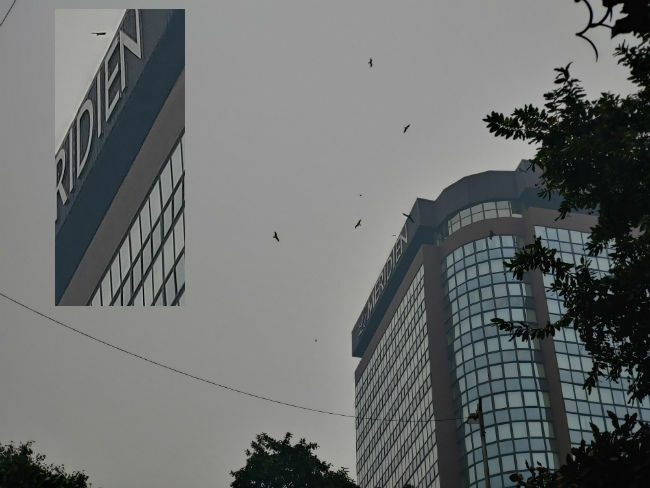 LG phones have been shipping with a wide-angle camera for a long time and every iteration has improved it to the point where far off objects like the buildings in the photo appear super sharp. It balances out the exposure making it uniform. 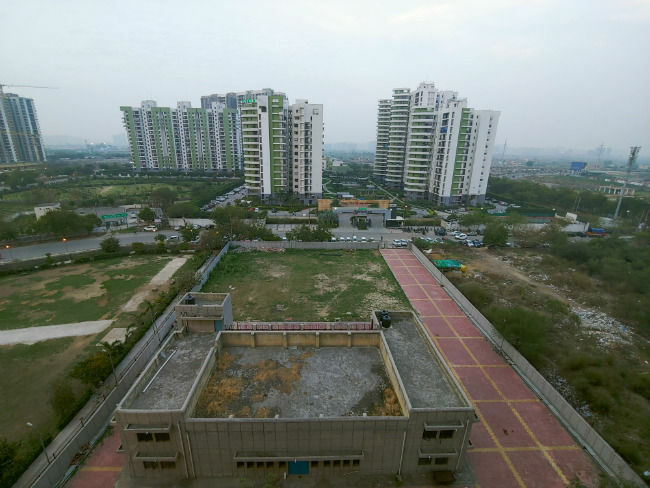 The only downside to the wide-angle camera is the lack of autofocus which the Huawei Mate 20 Pro offers. But you really don’t need autofocus when shooting vast expansive landscapes in wide-angle. Even photos taken indoors come out super sharp. The camera manages to preserve most of the details with excellent dynamic range. While LG cameras have always been proficient in wide-angle photography, this is the first time an LG flagship strayed into the other end of the spectrum. The 12MP telephoto lens on the LG V40 ThinQ is just as good as the other cameras, in terms of reproducing colours and preserving shadows and highlights. It also manages to preserve details well enough. When combined with available filters, you can also create some good aesthetic monochrome photos. The V40 makes it almost effortless. But you can choose to fiddle around with the exposure and even switch to manual mode which offers lot more customizability. While the sky in the photo is blown out for obvious reasons, every minute detail is very well preserved, while the contrast levels ensure excellent range between highlights and shadows. 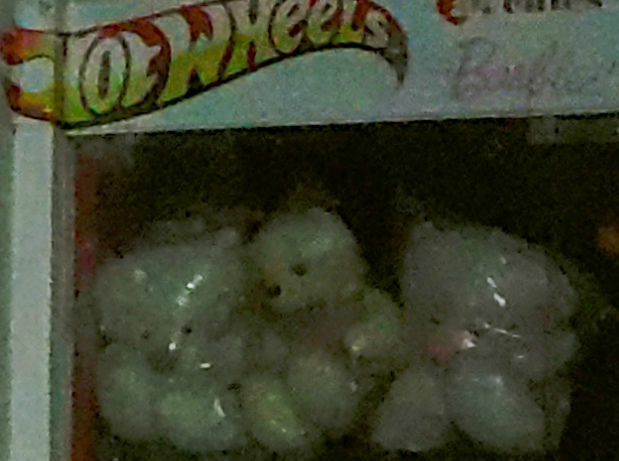 The zoom lens can also be used to capture far-off text like this one. It manages to retain most of details even after you crop it by 100 percent. The LG V40 ThinQ is easily one of the best cameras we’ve used so far. Interestingly, the LG V40 ThinQ uses the standard 12MP lens for shooting portrait photos, instead of the telephoto lens which is what most dual camera phones do. As a result, you do have get up close to the subject to take a tightly composed portrait, but thanks to the larger sensor on the standard lens, it also manages to capture more details. The subject separation is also quite distinct in portrait photos and it doesn’t heap unnecessary beautification filters on the subject either. All that’s good with the LG V40’s camera comes undone when the sun comes down. The LG V40’s low-light capabilities aren’t what flagship cameras are expected to offer, but it’s not that it does a horrible job. The V40 camera, as the sample above reveals, is quite capable of retaining texts and logos in the frame. Heck it can even keep far-off objects like the pillars in focus, but it’s the overall water-colour effect of the background that ruins the frame. The phone tends to overdo noise reduction making the background appear smoother than it is, resulting in the posterised effect. Low-light photos taken with the wide-angle camera can be used infrequently to compose aesthetic shots like this. While there’s hardly any details in the shadows, the photo appears well-balanced particularly because of the sharp retention in the details of the logo as well as the reflections on the ground due to the water. There is significant amount of noise in the photo though since the ISO is high, but interestingly, the camera failed to capture ISO information sometimes when shooting in low-light. In both cases where ISO wasn’t captured in the metadata, there appeared a lot of noise. It could just be a software defect, but the fact that a tricky situation like this leads to a noisy output isn’t very encouraging. The closed shop was well-lit with surrounding light and the photo should have gotten a lot more detail out of it, but the LG V40 fails miserably to do any justice to it. The front camera of the LG V40 ThinQ is nothing to write home about. It’s pretty average in terms of image quality especially in low-light. The wide-angle camera also doesn’t offer that wide a field of view as the standard shooter. 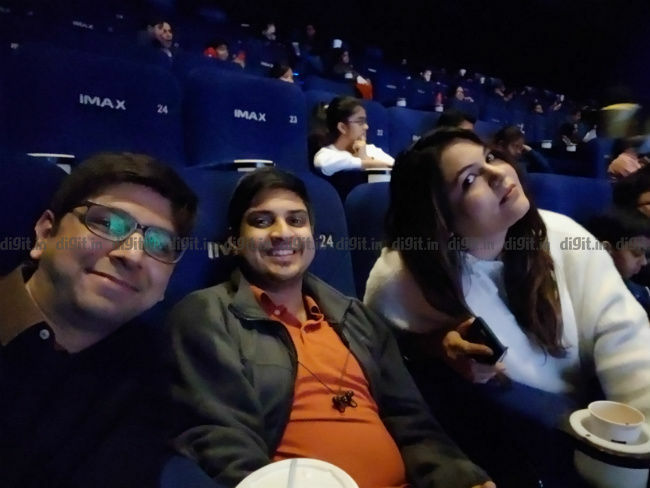 Furthermore, the front camera seemed a lot slower than the rear setup and as a result, the details, especially in low-light came out blurry with lots of noise. 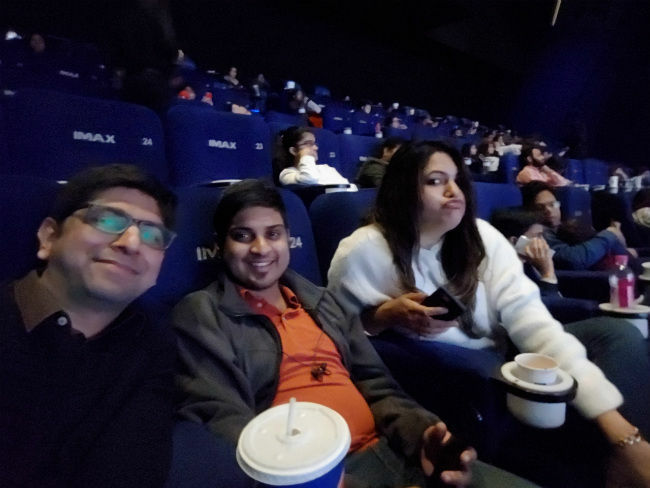 We have seen the Google Pixel 3 and the Galaxy S9+ take far better selfies than this one. The LG V40 ThinQ’s camera is nowhere close to what the Pixel 3 can do, but it can easily give a Samsung Galaxy S9 a run for its money for its accurate colour reproduction and dynamic range, but not so much on the details and in low-light. You can browse through all the high-resolution photos shown in the samples in the Flickr gallery here. The LG V40 ThinQ, apart from the LG G7+ ThinQ is the only phone right now that can shoot HDR videos. Not that it’s really helpful, but that’s some way to set yourself apart. You will need a HDR-enabled display to watch the videos in their full glory, which is there on the phone itself. But looking at the videos we took on a big screen showed just how good LG’s V-series phones become in their video capabilities. HDR videos are available via the Cine Mode where the V40 also offers a range of colour filters which the company claims have been calibrated with the help of cinema experts. While shooting a video, the mode offers ‘point-zoom’ which zooms in on any object in the frame without having to keep it in the center. However, the implementation of the feature was confusing. You will need to first tap on the point-zoom option on the screen and then select the part you want to zoom in to, all the while shooting the video. The feature also clashes with exposure control which is what comes up when you tap on the display without tapping on ‘Point-zoom’ first. However, the phone’s stabilisation is super useful while shooting videos. When using the standard lens, there’s 3-axis OIS while on the others, you have EIS. The change in stabilisation is apparent when you zoom in, as after a point, the zoom starts becoming quite shaky. However, you can take some smooth pan shots using the phone without any jerks. The V40 makes shooting cinematic videos easy. You can take a look at some of the HDR videos we shot using the phone in our Flickr gallery. Note that the videos will require an HDR-enabled panel to get the full experience. While just about everything in the LG V40 ThinQ shines in flagship glory, the battery life of the phone isn’t. Five cameras, a qHD POLED display, HiFi DAC and all the bells and whistles that the phone offers takes up a lot of power when used. The 3300mAh battery, as a result, never felt adequate in my week’s usage. The phone lasted around six hours on Geekbench’s battery test while in our in-house video loop test where we play a 10-minute on loop till 5 percent battery with screen brightness to 100 percent, lasted 5 hours 40 minutes. Considering how this phone is pegged at creators who are expected to go out and shoot in obscure locations, the battery life is a real deal-breaker. 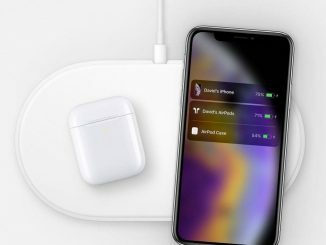 Thankfully, it does offer 18W fast charge as well as support USB Power Delivery and Qi Wireless Charging. The fast charger that comes with the box tops up the phone in around 1 hour 45 minutes.